Published in 2010 by Constable. Over the heathery flanks of the mountains, over the lochs, over the vast tracts of land that make up the county of Sutherland in the very north of Scotland, down to the fishing boats bobbing at anchor along the west coast, the amazing news spread. That most famous of highland bachelors, Police Sergeant Hamish Macbeth, was to be married at last. This wouldn't be my normal choice of reading, but I couldn't resist it when I saw it sitting in the library, looking like the new kid at school. It was sat on the counter, looking all shiny and new and no one had checked it out. So, like a thieving magpie, I quickly grabbed the shiny book and checked it out. I can remember many years ago, when Hamish Macbeth was a series on television with the charming Robert Carlisle. I used to sit down with my family every Sunday night, with my cheese on toast on my lap, pyjamas on and watch it intently. It has been many years now since it has been on television, so I was quite surprised to find that the book series is still going strong with this being the 25th book in the series. f you are looking for a cosy Scottish mystery, then you will find it here, hidden amongst the pages with the lochs, hills and dales. In this book, Hamish Macbeth is about to marry his constable Josie McSween, who helped him to solve the Valentine's Day murder. The book follows the investigations into the murder, as well as the supposedly blossoming romance of the happy couple. The murders within the book are dealt with swiftly, you will find no gruesome descriptions of bloody corpses here. As Hamish reaches a point of discovering who the murderer is, someone else is found dead. I really enjoyed this book, it was nice to step back into another time period in my life whilst reading it. Hamish was honourable and charming all the way through, unlike his bride to be, who had some serious issues that needed addressing. Hamish is the eternal bachelor and everyone either wants to marry him or marry him off to a prospective partner. The book is full of quaintness and the town has that time stood still aroma to it. I felt like I had stepped back into Brigadoon and had visions of Gene Kelly tap dancing out of the pages. There is humour and madness and mayhem through the book which results in a happy ending. I am keen to read some more of Hamish antics, so I may venture back to the beginning of the series and see what I find. After reading this, I didn't feel that I needed to have read the previous books, this can definitely be read as a stand alone book. Has anyone read any of the Hamish Macbeth book? Which ones did you enjoy? I didn't really enjoy the tv series and was wondering how this novel compared to the televised version. I do love a cozy mystery and the Scottish setting sounds charming to me! It sounds vaguely familiar...I'll have to investigate it! I love anything set in Scotland, Ireland, or England...I'm besotted, as they say! I love cozy British mysteries that just make you feel WARM :-) Especially when they are witty and fun. I'll keep an eye out for this one! Hamish Macbeth sounds like a terrific author. Why haven't I heard of him before? Thanks for your review! Did you imagine Robert Carlisle as you were reading it? I think I would quite like these books. I have never read Hamish Macbeth although I have a couple on my shelf. I like cozy mysteries too and Scotland is always a lovely setting. I so enjoyed reading of your memory of watching the tv series. Cheese on toast-how quaint! 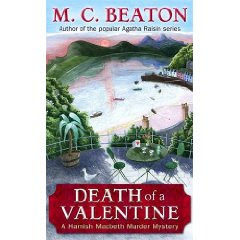 I have not read any of Beaton's works, yet - but I do want to try Hamish Macbeth as well as Agatha Raisin sometime soon. Ooh - the words "cosy Scottish mystery" appeal to me a lot. I'll keep this in mind! I need a good cozy mystery from time to time, but have not tried this author. Perhaps in the future....sounds fun.